Literally. Baby Jesus that is. Every year our neighbors host a live nativity at their farm. I’ve never gotten to go to it in the past as there has always been something else going on that night. This year they asked if they could borrow some sheep for it and I agreed. So of course I sent Herbert, Mr. Social himself, along with a couple of the wethered lambs. Herbert is always a crowd-pleaser and the wethered lambs are still small enough that they look like lambs. This wasn’t that kind of nativity. I would actually call this a pageant. Everyone came in and sat-down on benches in the barn. There were singers and actors and readers and a full-on sound system. There was a donkey that reluctantly carried Mary in on it’s back. There was a whole flock of little angels in costume complete with tinsel halos. There was a King Harold complete with lit-up throne. 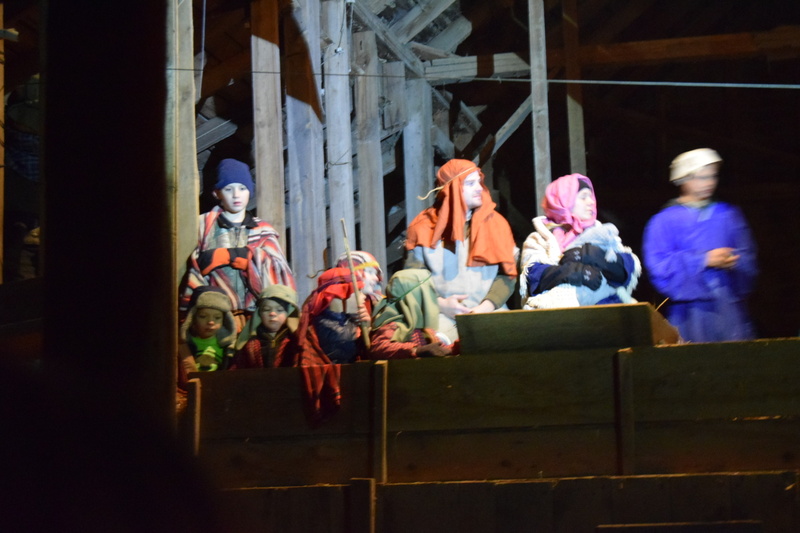 There was a person in the rafters of the barn shining very bright flashlights on the actors as the lighting department. There was an angel (child) that was hung-out on cables and reeled back in after saying his lines. I mean, this was a full-on production. It was wonderful and touching and completely homemade. There wasn’t a touch of the commercial about it. It was simply my neighbors with their family and friends putting on this wonderful show for the rest of the neighbors and friends and anyone who happened to drive by and see the sign. And in the midst of all of this, were Herbert and the lambs. You can see the sheep down below King Herod (in purple). Sorry about the fuzzy, I didn’t really want to use a flash during a production. The little flock did well. The lambs were more nervous than Herbert as this was their first outing away from the farm. Herbert, however, was his usual calm and friendly self. 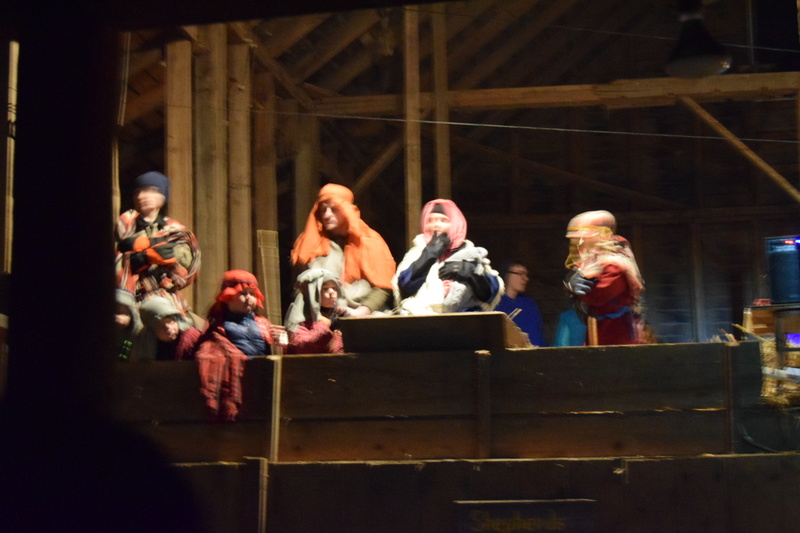 The only time that he got a little nervous was when all 100 plus people in the barn started singing “Silent Night”. He’s not exactly used to group singing as we didn’t really serenade him at the Iowa Sheep and Wool Festival last June (though that is an interesting idea….). He received lots of head scratches after the program was over from the kids and adults that were in attendance. If the neighbors ask to borrow the sheep next year, I think that I will try to take part a little more. I can walk Herbert around for people to pet before hand and probably keep him on his lead so that the shepherds can “shepherd” at least one sheep in with them. Also, I will let them borrow my shepherd’s crook, for authenticity of course.